On this page we gather BLACK HANDBAGS, BELTS, JEWELRY and ACCESSORIES. Nothing basic or dull about any of these bags, gathered from several of our artistically inspired designers! 1-1/2 inches long on sterling earwire, 7/16 inch across. Metal ellipse is slightly curved and colored a tonal matte black, with silvertone tendril sweeping across the top. Rich with color of glasslike jeweler's resin, this bangle has oval shape, hardware in gold vermeil (18kt gold over sterling). Hinged for easy on-off (hinge stays under wrist), and magnets in the ends help keep it closed. Measures 2-3/8 inches across, 1-3/4 inches deep, for small to medium wrist. 1/2 inch wide and rounded top surface. The color is opaque jet black. Twisting lifesaver links are intertwined into a lightweight classic earring. Glasslike jeweler's resin forms two of the loops, at center is a gold vermeil one (18kt gold on sterling). 1-7/8 inches long, 7/8 inch across, a surgical post is located at the very top. The color is opaque jet black. 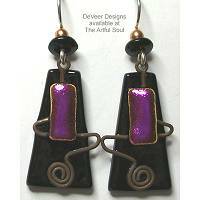 By The Artful Soul, this is part of a charcoal geometrics polymer clay collection, with dark shades of hematite gray and black. 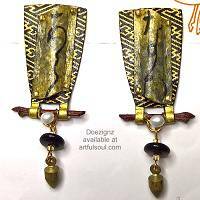 Detailed handbuilt patterns are sliced and mounted onto background clay, accented with silver leaf, then fired. Light and artful. 1-1/4 inch triangle earrings have surgical post 1/2 inch below top point edge. 1-1/2 x 1-1/2 inch pin has barpin clasp to wear at angle shown. For more jewelry that features black gemstones, see our Black Onyx page. 1-7/8 inches long on niobium earwire, 1/2 inch across. Carved bone tube has twinkling star motif and blackened color, suspended below fancy brass barrel and silvertone ring. 1-3/4 inches long including sterling earwire, the shiny silver flower cutout shape is 5/8 inch across. Black crystals drop below. 1-1/2 inches long including sterling earwire, 1/2 inch wide spade shape in background in jet black color has silver leaf cutout on top. 1-3/4 inch long including sterling earwire, 1/2 inch across. 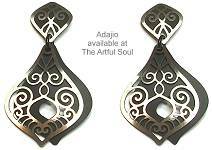 A copper finish round disk has silver leafy motif cutout on top, a matte black metal dangle below. 1-1/4 inches long including sterling earwire, 3/4 inch almost-round silver disk has spiral pattern, smaller jet black disk and silver spiral on top. 5 inches across center are the long hammered rays, each with a wider end and different length to flair outward to almost 8 inches on neck. 2 inches long at center. 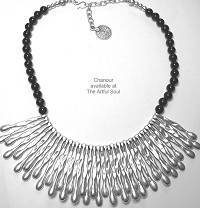 The design is attached to 8mm black beads, final chain and hook closure in back for 16-18 inch finished length. Each element is cast in pewter, antique silver plated for satin sheen, lead and nickel free materials. Made in Turkey, weighs about 3.9 oz. 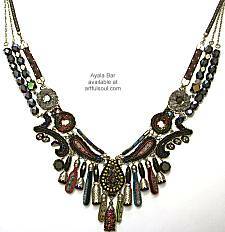 18 inches long, 9 strands of glass seed beads have larger beads attached at regular intervals making for a busy look in rich color. Magnetic metal clasp. Jet black beads with onyx chips and faceted crystals. 1-7/8 inches long, 1 inch across. Goldtone earwire holds a dangling cluster of glass and crystal beads. The cluster joins the various shapes and sizes with brass wire and a central butterfly charm with a flourish of spiral wire below it. Bead colors are jet black.